1. Use social media to help your campaign. Yes, we just said customers are more tolerant of e-mail pitches. But an established social media presence will smooth and enhance the path to direct communication. Social media also can prep customers for the holiday ahead. Tweet about Valentine traditions with a connection to your products or post them on your Facebook page. And don’t forget the occasional e-mail newsletter from your business, which forms a bridge between socializing and direct offers. 2. Prep your customer e-mail lists. E-mail marketing means content and tone. No one wants to peddle Brazilian waxes to guys or straight-razor shaves to ladies. The playful, humorous approach that puts men at ease is a dud with women, who prefer sincerity on most occasions. Sort recipients based on the products you intend to market. For V-Day, keep it simple: men and women, then old and new customers if you have a loyalty program. Here’s where a third-party e-mail company is invaluable. Among other services, it will sort lists, verify addresses, monitor response and stock ready-made templates for your e-mail, whether its candy hearts or candy canes. If you don’t have one, get one. 3. Put added value in your e-mail pitch. Valentine’s Day (like Mother’s Day, Father’s Day and Christmas) is more personal and often more fraught. Connect with customers by being helpful in their time of shopping stress. Include Valentine’s date ideas for your male clients. Suggest a gift card purchase option to if they’re stumped for ideas. 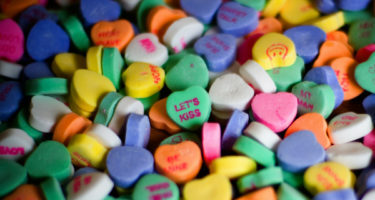 Remember: men spend twice as much as women on V-Day, according to the National Retail Federation. Cite brief customer testimonials, which foster trust. Thank clients that bought last Valentine’s Day by offering a bigger discount this year. Distinguish your local business from national competitors by assuring delivery as late as possible near or on the big day. 4. Find strategic partners that enhance your offer. Let’s say you sell a Valentine-friendly product like chocolates, but are unsure about e-marketing on your own. Or maybe your business is fairly new and you don’t have a big customer list yet. Team with a complementary partner like a jeweler or wine store and deliver a one-two sales punch. Congrats! You just made life easier for the shopper who doesn’t want to sift through different e-mails to buy truffles and a gold bracelet. Ditto combining services: Ms. Mani/Pedi, meet Mr. Hotel Room. 5. Find strategic partners that have what you don’t. Suppose your goods or services aren’t Valentine’s Day-oriented? Find a business that is and join forces. Example: You run a chain of car washes. Think of guys that want to spiff up their wheels for a date and boost the offer by partnering with a florist that will leave a bouquet in every vehicle. A dry cleaner could team with a wine store or chocolate shop by offering a deal on post-Valentine stain removal. Don’t instantly reject ideas. Consumers nowadays think in less linear and narrow ways about purchasing. Just look at the mix of offers from Groupon or LivingSocial. 6. Piggyback with deal-of-the-day merchants. If a Groupon, LivingSocial or Gilt Groupe likes your business and you like their revenue-sharing agreement, bravo. They’ve got millions of subscribers and in-house staffs to put great spin on your stuff. That doesn’t mean you just sit and wait. E-mail your personal customers, letting them know about the deal — nice reciprocity for a deal-of-the-day merchant since it means more subscribers. Because these merchants also include a link to your website, put more deals there. Finally, send a thank-you to every one that bought a coupon. 7. Set up a mailing schedule. When and how much to e-mail is a huge challenge. Sensitivity to time of year is one guidepost: Are folks still paying off Christmas bills? Another is research. Digital marketer Oneupweb reported top online sales in 2010 were February 5-6. That corresponds with e-mail offers tracked by Chad White of The Retail Email Blog. He reports Valentine e-mails peaking at an average of 2.9 a week for the week ending February 4. That same period also saw the first President’s Day and St. Patrick’s Day e-mails. Based on the above, a month out isn’t too early. A week out is peak. Still nervous? In your first e-mail, include an option that lets recipients state how often they’re okay receiving your offers. Customers will love you for it.